Okay… I guess we’re just getting right into it. 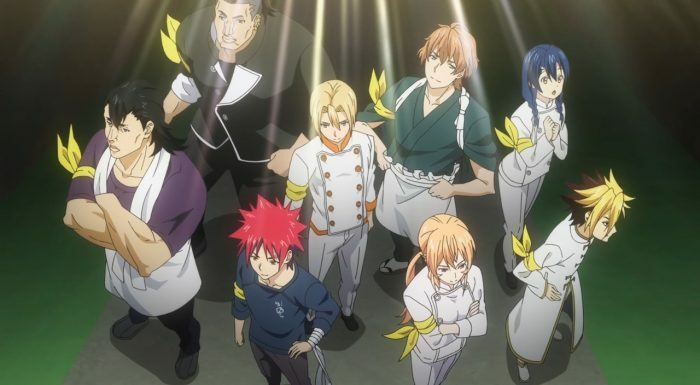 With a mere 2 or 3 episodes left, Shokugeki no Soma – San no Sara is jumping right into the Team Shokugeki arc. To say I’m surprised is putting it mildly. With all the buildup and the culmination of the franchise’s various plotlines all kind of converging in on this particular event, it seems like a really bad idea to just rush to and possibly through this particular event in the story. Yet, here we are, whether we want to be or not. And I’m sure the answer to the question of want for most people is definitely “yes”, but for me? Its a bit more complicated. See, for the two arcs of the story that I was most looking forward to, this third season of Shokugeki no Soma definitely short changed me. It rushed through parts of the story that I think merit care and most certainly time. So, with those two arcs having been rushed through, I’m afraid that something as grand as Battle royale between Soma’s group and the Elite Ten, will be just as quickly glazed over. I already feel like I’ve missed a good chunk of the story. Since I haven’t read the manga I can’t say if anything was cut, but I do feel like Soma and co’s entire training arc would’ve been something I’d have liked to see. The gathering of forces, convincing the third seat to join them, and the overall battle plan, well those are story tidbits that I believe we need to see. Now, as to whether this is all intentional is not known, as the show could just as easily provide us that context via flashback. Maybe its a technique to flash forward into the meat of the story, and then add in the relevant bits as needed. Sure, maybe, but the problem is that this show has sped through so much where I can’t be entirely confident that I’m getting the entire story here. Plus, I’m not sure if stopping in the middle of the Team Shokugeki is the best course of action. 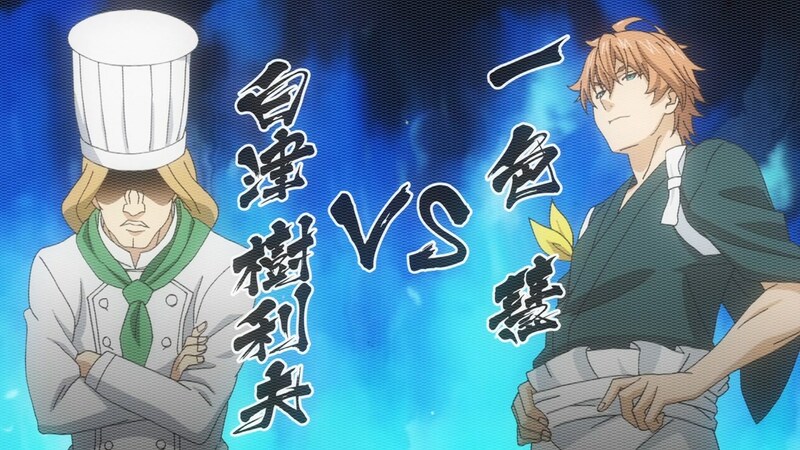 Shokugeki no Soma fans endured that once before with the first season’s ending, and it feels really mean to have us go through that again here. Either that, or the Team Shokugeki resolves in another 2-3 episodes, which, man… I hope not. So I guess I wanted to state all that before hand, because I can’t help but have the episode count color my opinion of what was otherwise a pretty solid episode. The first element, was of course, having the expelled rebels make a return and cheer for the Soma and the rest. I have to say, I really like Alice as a character, and beyond Soma and Erina, she’s a good leader that rallies people around her. Her keeping a positive attitude and pushing for everyone to keep going despite their failure and pain, well, its something that was sorely needed among that group of kids. 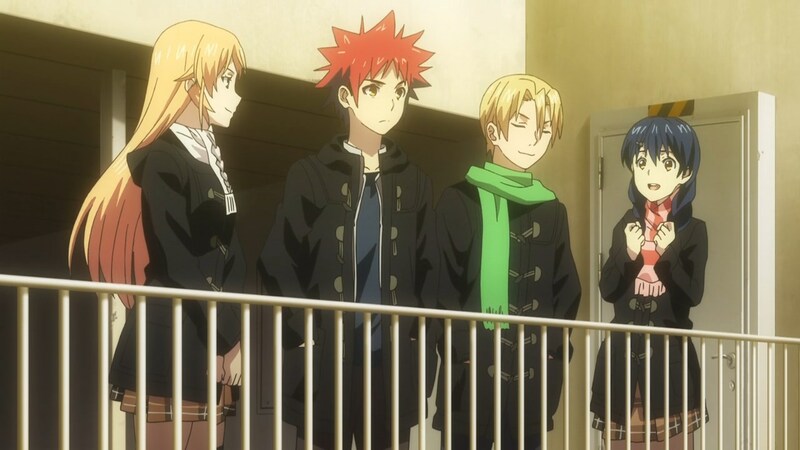 Hayama being dragged into the group, was also a nice moment, and something that you could only expect from Alice and how she gets attached to the people she likes. Now as for the start to the Shokugeki itself, it was certainly unpredictable. I wasn’t expecting Soma to join in this quickly, but I suppose we need our protagonist to kick things off in style. To that end, I think the matchup of having one familiar character alongside everyone else, was a good move. 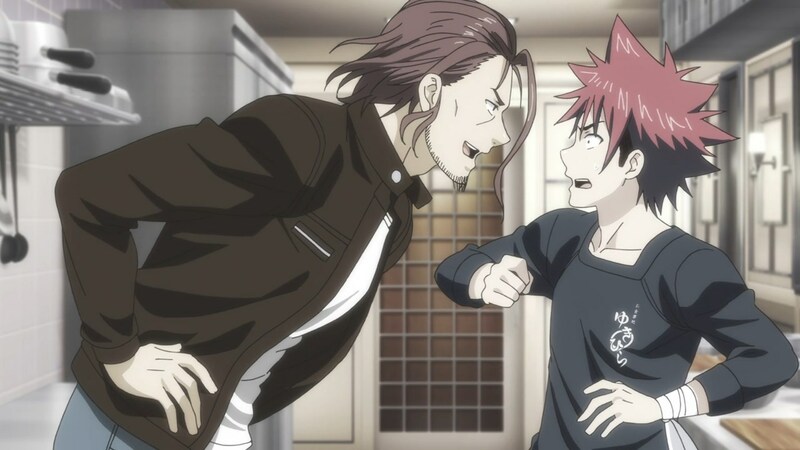 Soma versus Nene is interesting, and not just because Soma put himself in the absolute worst situation. A big part of Shokugeki no Soma’s central theme has been the tension between “elitist food” and “food for the masses”. Soma is obviously a champion of the people, and creates food that appeals to everyone, and not just for the selective pallet. On the otherwise we of course have Nene, a girl who’s been raised in a famous and powerful family that’s involved in the Soba industry of the country. The classic “elite” versus the “Everyman” scenario we’ve come to expect from the show. 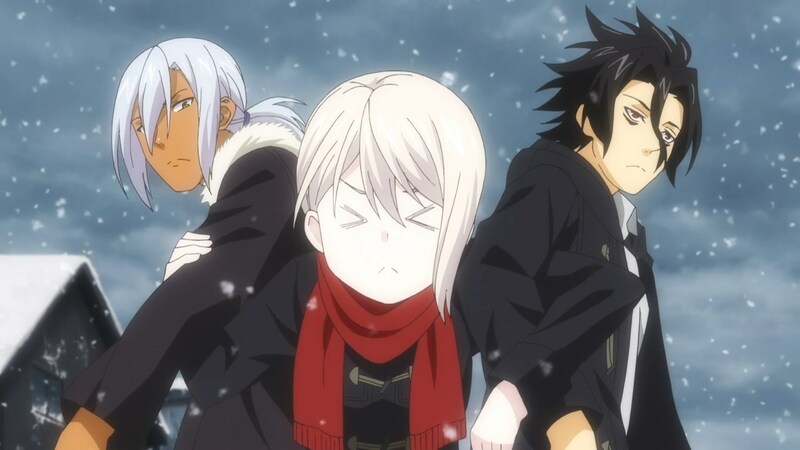 Now… Unexpectedly, despite Soma being part of the initial line up, it seems the initial focus of this first round of the Team Shokugeki is actually going to fall on Isshiki. 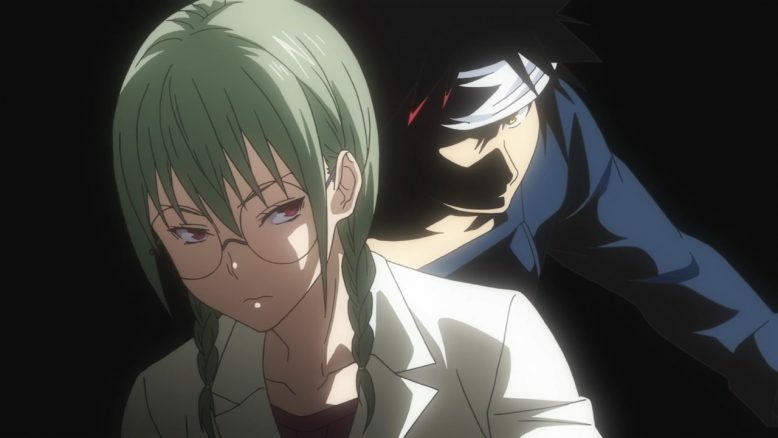 Isshiki is an interesting character in that he’s, up til now, just kind of been in the background. We’ve known him as more of a joke character, with his weird naked apron antics, than an actual seriously talented chef. But, as any avid watcher of anime will tell you, its the smiling, funny characters that actually hide a rather serious side behind all the facade. To that end Isshiki actually bares his fangs this week, but not after some prodding and poking. Interestingly it seems that Isshiki is also a part of some renowned family, much like the other members of the Elite Ten. UNLIKE them, however, he certainly values creativity and his “normal” friends, over just the elite. 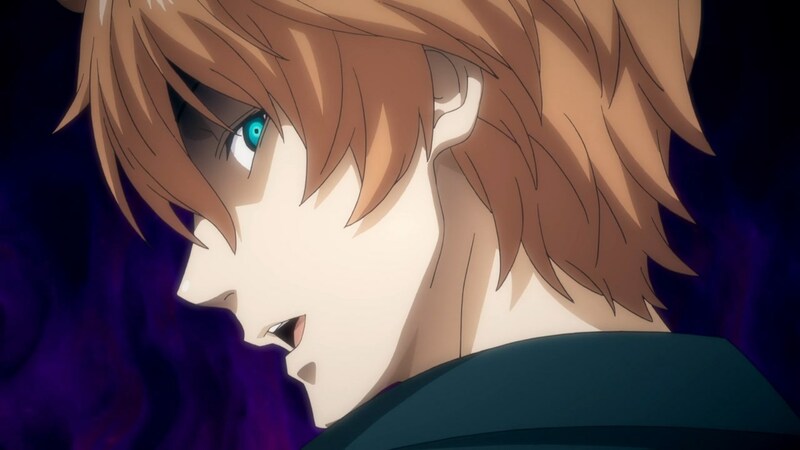 To that end, its not insults to Isshiki himself that set him off, but rather when the current 8th seat insults his Kouhai (underclassmen) in the Polar Star Dorm. 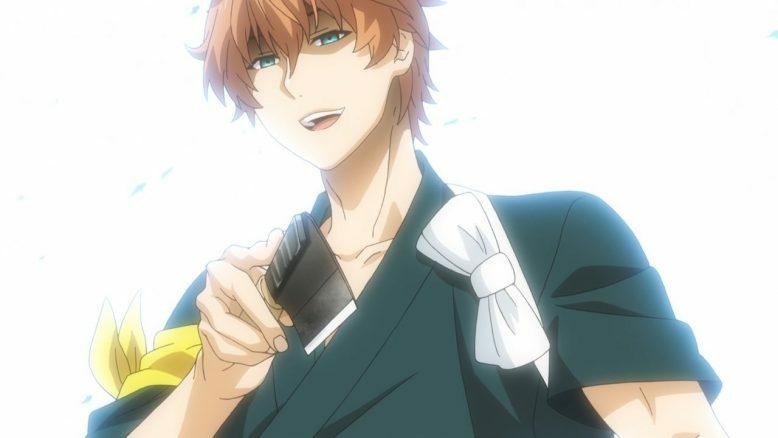 And I must say, seeing Isshiki go from smiling and cheery to angry and dead serious was as much of a cool moment as I imagined it would be. We’ve seen from Soma’s first informal duel with Isshiki that he’s a force to be reckoned with, but it was certainly hype inducing to hear even Soma comment on how non-serious Isshiki was back then. So, in essence, we’ve never really seen the true, serious Isshiki, and its now, at the advent of the Team Shokugeki, that we get to see it all. If there’s one little flaw in this whole arrangement, its that Ishiki is facing a character that’s more or less a grunt. We’ve not seen this character before, nor has he been properly developed to seem like a real threat. He’s just someone that Ishiki is going to dominate, and honestly, I would’ve preferred Ishiki facing someone like Eizan rather than a new character. In any case, I suppose excitement is definitely there, although I have it with some degree of caution. This season is nearing its final stages, and with it, comes that sense of dread and loss that I feel every time a Shokugeki no Soma season ends. Will we get another season? I’m never sure. I wasn’t sure we would even get this third one, so at the very least, I hope that if San no Sara does end at a weird point, it at least announces a confirmation for a fourth season. Either way, I guess we should enjoy what we have left of Shokugeki no Soma. There’s still at least another 2 episodes, and then we can ruminate about what comes next. For now, we are very much in the thick of the Team Shokugeki, and Ishiki’s upcoming dominance is something that I can’t wait to see play out.